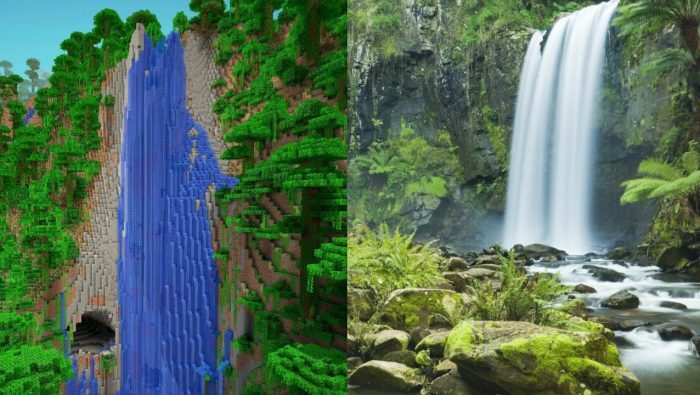 It started on April 1st (a day to be wary of all things on the Internet, as is)… a series of tweets from the Minecraft community on Twitter about features of the popular game Minecraft being copied into real life. Minecraft is a sandbox game that can either be used as a creative building tool, or played as a sandbox survival game. In survival mode, the player has to explore an Earth-like world and gather resources, by chopping down trees or mining ores out of the ground with a pickaxe. The game is obviously inspired by real life trades such as lumber-jacking and coal mining, but the resource gathering can be quite immersive. But, being April Fool’s Day, some players decided it would be funny to pretend that Minecraft came first, and the world is trying to catch up. Even villages! What about other structures? I want to visit a Nether Fortress! Those too!!! OMG I’m totally looking forward to tearing that down for cobblestone! What??? YAAAzzzz! Ocelots are even cuter in real life, yo. Yes, people of Earth! Please keep making things from Minecraft into real things.